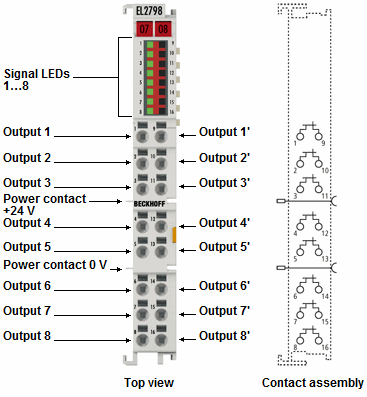 The digital EL2798 EtherCAT Terminal provides eight switches that can be used like a relay contact for AC/DC voltages. The electronic switch is realised through high-performance MOSFET transistors with low switch-on resistance. The switch itself is not short-circuit-proof, but due to its high pulse current capability it can cope with current until the fuse triggers a switch-off. Inductive loads can be switched directly, without further safety measures. High peak voltages and electromagnetic interference pulses are prevented.